Boats able to transport all ground units across water. Barges are water transport units which can load other ground units (up to 2, like a Balloon) into them and transport them over long distances. They need a beach to Load and Drop. They're available to recruit from a Port. Transport units cannot attack other units. When ground units move beside them they'll have the menu option 'Load' to enter the transport. After moving the transport has the option to unload the unit inside, or to wait. Barge Cherrystone Kingdom During Peacetime, these Barges are used to trade goods with Heavensong. It's not uncommon to see children waiting at the docks to sing a song to the Merfolk onboard, hoping they might share some of their cargo. "Ello Mister, how do ye do? Plip plip, plip plip. Where have you been travellin' to? Plip plip, plip plip. Did you bring back somethin' nice? Plip plip, plip plip. Silk and spices, herbs and rice? Plip plip plip! Once in a while, the Merfolk hand out brightly coloured exotic seashells found on the Scorched Beach and the children are left daydreaming of lands far away. Barge Felheim Legion It takes particularly brave Deepfolk to pilot a Barge full of undead cargo. Those with experience, however, will know that once a Barge reaches open sea, the rocking motion of the waves tends to send the undead to sleep. With no nose to snore through, they rest in eerie silence, dreaming the dreams they had in life. Barge Heavensong Empire Heavensong's fleet of Barges were originally built as trade vessels, importing and exporting goods from lands both near and far. Each Barge is beautifully constructed and able to remain at sea for months at a time, facilitating trade with peoples beyond Aurania. Since being commissioned for war, their hulls have been strengthened and their capacity has been increased. Barge Floran Tribes The Floran Barge is a simple vessel, poorly constructed and partially reclaimed from coastal wreckage. 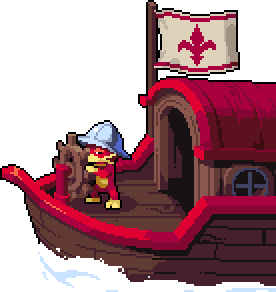 No one is really sure why it floats... it probably shouldn't float, but it does... Heedless and gutsy, the Floran are all too happy to pile into one and take to the open sea. It's unclear if the wheel at the front of the vessel is actually attached to anything, but turning it seems to make the captain happy. This page was last modified on 15 March 2019, at 16:34.